Back in June, News Corp put two more of its newspapers, other than the Wall Street Journal, behind a paywall: The Times of London and the Sunday Times. We kind of expected it to be a disaster, but now we actually have some results. The company announced that it signed up 105,000 paying subscribers, plus another 100,000 who were already subscribers to the print newspaper. But what did the Times lose? 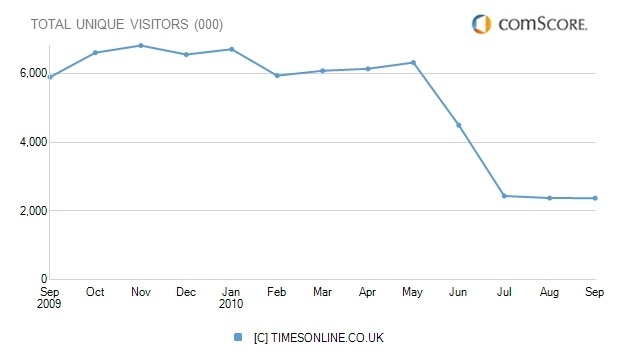 According to comScore, the Times UK website saw its online readership decline by 4 million unique visitors a month worldwide to 2.4 million, or a 62 percent drop. Pageviews fell off an even steeper cliff, plummeting 90 percent from an estimated 41 million in May, 2010 to 4 million in September, 2010. People did what you’d expect them to do when faced with a paywall at a news site. They said, “No, thanks” and clicked away to another site. So is this tradeoff worth it and will other newspapers like the New York Times suffer the same fate once they erect planned paywalls? Mathew Ingram at GigaOm explains why this experiment looks like a failure. Before we pile on here, let’s take a look at those numbers. Basically, those 50,000 monthly subscribers are paying $12.80 a month, or $640,000 a month total. Let’s say the other 55,000 pay-as-you-read crowd is generating another $160,000 a month in subscription revenues (I am being generous here and assuming two days a month per person at $1.60 per day). That comes to $800,000 a month, or $9.6 million a year in online subscription revenues. What did they give up in online advertising revenues? At 41 million estimated pageviews a month, assuming a $5 CPM (cost-per-thousand-impressions), that was only $200,000 a month in online advertising revenues. I am not counting the Sunday Times site here, but the lion’s share of the traffic went to the Times UK site. Maybe the average CPMs were higher if the online ads were bundled together with more expensive print ads, but in order to match its paltry subscription revenues the Times online ads would have to command a $20 CPM, which is really high for a general news site. Depending on the actual CPM, financially they are doing at least two to four times better than they were before. And that is with only about 1.5 percent of their former readers becoming paying subscribers. You don’t need that many subscribers to make up for lost advertising revenues online. But the way the (offline) media business works is that subscriptions and advertising go hand in hand. the more subscribers you can show advertisers, the more they are willing to pay. On the Web, that calculus breaks down, so media companies are forced to choose between going after advertising revenues or subscription revenues, but rarely both. Whether or not going behind a paywall makes sense depends on two things: 1) how many paying subscribers can you get with a paywall versus 2) how big an audience can you get with a free site. 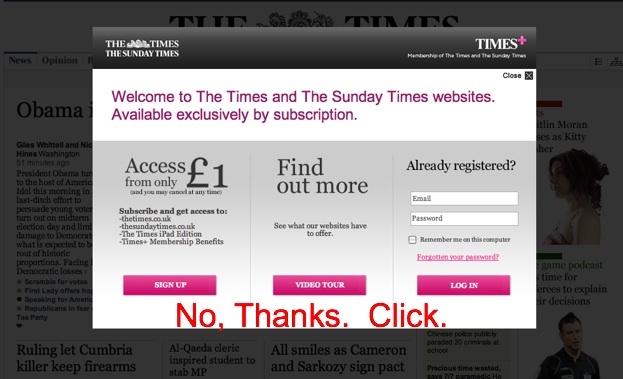 Could the Times UK double or quadruple its online audience if it were still free? Alternatively, could it raise its advertising rates. That all depends on how good its articles are and whether they can attract a growing audience. On the other hand, maybe it’s easier for the Times to add another 50,000 or 100,000 paying subscribers. The fact that News Corp decided to put the paper behind a paywall speaks volumes about which path it thinks is going to be easier. But media businesses require advertisers. They always have, they always will. Advertisers want to reach broad audiences. The number of loyal readers willing to pay for an online subscription to the Times will peak eventually if it hasn’t already. Once it does, where will the Times go from there?